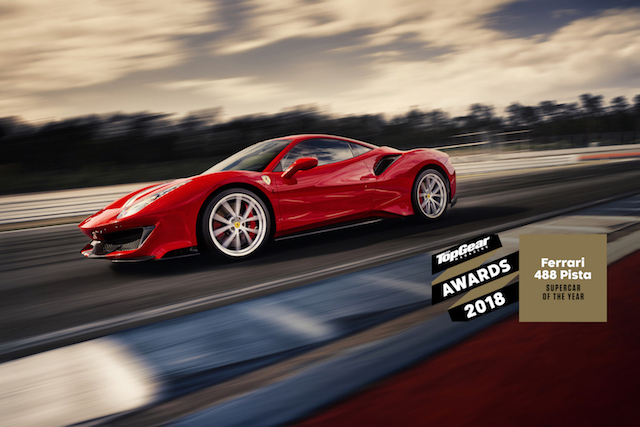 Ferrari, the symbol of the super sports car all over the world, was awarded the, Super Car of the Year olan award by BBC Top Gear, one of the world's leading magazines with 488 Pista model. The 488 Pista, which is derived from the Ferrari 488 GTE and 488 Challenge racing cars, stands out with its engine that produces 50 HP more than the 90 kg lighter than the 488 GTB with a weight of 1.280 kg. This engine, which won the Engine of the Year award in 2016 and 2017, produces 185 HP per liter at 488 Pista, allowing the car to accelerate from 0 to 100 km / h in just 2.85 seconds. With the aerodynamic add-ons carried out at 488 Pista reaching 340 km / h at the final speed, the ground pressure is increased by 20% compared to 488 GTB. F1-Trac, the world's best in terms of handling and braking, the magnetoreological suspension system, the E-Diff3 differential lock and the Ferrari Dynamic Enhancer system with a special software for caliper brake pressure, which is used for the first time in the world, also brings the driving pleasure of 488 Pista to the top. .